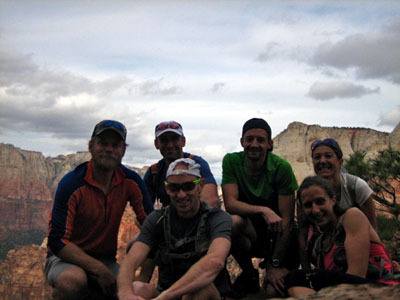 It had been far too long since I’d been to Zion or done a run of any substantial length. This Summer and Fall Mindy and I have spent nearly every spare moment planning and building our new home. Built on passive solar design principles and employing an impressive 8kW PhotoVoltaic (PV) array to harvest all the energy required to run it, our house has blossomed into something we are both very happy with and proud of. More details on this in the coming weeks as we wrap it up and move in…..
After a Summer and Fall of being a rather unreliable partner I was thrilled to finally be breaking free to make a weekend trip happen. I was bummed that Mindy couldn’t make it, but also excited about meeting up with friends Krissy Moehl, Chad Brackelsberg, Emily Mitzel, Ryan McDermott, and Fred Marmsater. Krissy and I ran the traverse together from Lees Pass to the East entrance with an excellent side excursion to the East Northgate Peak. The home project had taken precedence over training and consequently I was going into this in perhaps the lowest level of fitness I’d been in for quite some time. I knew this was going to hurt! Fortunately Krissy was very kind and patient with me and we found ourselves laughing and shuffling along the traverse with near perfect weather. We crossed paths with Chad and Emily who were going in the opposite direction and we eventually all met up in Springdale for dinner. Sunday I took the entire group out to Crawford Arch, one of the most incredible places in Zion. What a great weekend. 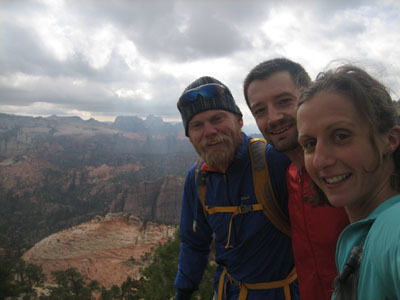 The beauty of Zion and the important role of good friends was the theme for this trip. A few pics here. Hopefully I’ll get some of Fred’s soon. 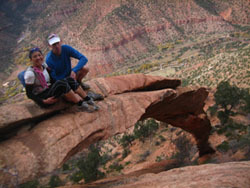 Wow, you took them to the Arch … a great route that benefits mightily from a guide … good for you! I hope they bought you dinner!